ACOMA, Wash. -- When Mitch Davis needed a high-speed launching pad for his startup Internet company, he ditched high-priced Seattle for its blue-collar neighbor some 35 miles to the south: Tacoma. When John Gorst needed a place to set up his Internet utility company that provides Web hosting of applications for small businesses around the country, he moved to Broadway -- that is, 1101 Broadway Plaza in downtown Tacoma. And when e-commerce giant Amazon.com went searching for a site for its next-generation call center, guess where it landed? Tacoma. set up shop in the South Puget Sound city in Washington since the launch of the city-owned and operated Click! Network. "We could live anywhere we want, but we chose to come here to Tacoma," says Davis, founder and chairman of OnFree.com and InFree.com, one of the nation's largest providers of free Internet access. "We originally started in Seattle, but it's both hard and expensive to get high-speed Internet access there. It's also hard to find people and space in the Seattle area because of the high costs, and plus Seattle is now one of the worst traffic cities in the United States, along with Los Angeles and Oakland." What brought Davis, Gorst and the Jeff Bezos-run Amazon.com to this South Puget Sound city once known for its smelting factories and odor-rich paper mills? In a word, speed. More than 100 high-tech companies like OnFree have chosen to set up shop in Tacoma -- where office rental rates and housing costs are less than half that of Seattle's -- since the installation of the Click! Network, the brainchild of the City of Tacoma and its municipally owned utility, Tacoma Power. Since construction began in 1998, the city has completed 775 miles of a hybrid fiber coaxial, two-way telecommunications network at a total investment of US$100 million. And while this high-speed broadband access is a nice amenity for the city's 187,000 residents, it is an essential resource for companies seeking a competitive edge in the New Economy. 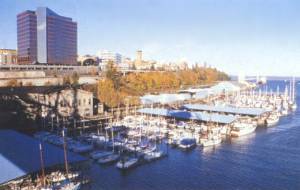 The story of Tacoma -- indeed, the story of second- and third-tier markets and rural communities all over America -- is the ability of forward-thinking government officials to level the economic development playing field by providing the kind of high-speed connectivity that fast-moving companies need. For Gorst, chairman and CEO of iNSYNQ, "The number one reason why we chose Tacoma was bandwidth. Plus, we're saving about 33 percent on the cost of doing business, just by being here in Tacoma. Two years ago, Tacoma wasn't even on the map. Now, companies from Redmond, Seattle and Silicon Valley are considering Tacoma. That's no exaggeration. Eric Cederstrand, vice president for Colliers International in Tacoma, says he has quit working in Seattle and King County altogether to focus on his commercial real estate development and brokerage business in Tacoma and Pierce County. One of the nation's busiest seaports, Tacoma is adding Web-based businesses to its already strong lineup of trade-based industry. The Port of Tacoma is the sixth largest container port on the West Coast of the US. "The Tacoma Technology Consortium, which started in July of 1999, has 300 companies today," says Cederstrand. "And 90 percent of our job market here is made up of 25-to-35-year-old high-tech workers seeking an urban experience. About 1.1 million sq. ft. (102,190 sq. m.) of new office space is being built right now in Tacoma." One of those new office space users is Amazon.com, which opened its 7,710-sq.-ft. (716-sq.-m.) Tacoma Customer Service Center at 3408 South Union in early December 1999. With about 100 employees, the new call center is a significant high-tech employer in Pierce County. "You have to remember that our software is not for complete rookies. We need some level of sophistication," says Julie Benezet, director of real estate for Amazon.com. "We also need enough people to work around the clock. 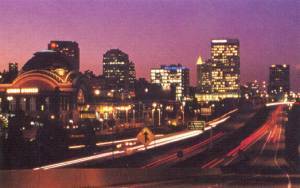 Tacoma has a large educated workforce with a good work ethic." When asked why her company chose Tacoma, she said, "We do look at the connectivity, but we also were looking for a building that we could have fun with. We wanted a light but efficient feel to it. We found a former bank building with lots of lighting. We are also extremely fast track, so we were looking for a jurisdiction that could act quickly, and we found it in Tacoma." Speed -- not just in transmission of voice and data communications but in governmental response to permitting needs for new and expanding facilities -- has become the rallying cry for smaller markets seeking to transform themselves into high-tech havens. Tacoma Mayor Brian Ebersole says it's this ability to rapidly respond to the needs of private industry that will give cities such as his a competitive edge in the future. "We just felt that the installation of the high-speed Click! Network was an appropriate investment for our future," Ebersole says. "The 100 high-tech firms that have opened here in Tacoma since the installation of the network have generated more than 700 new jobs in the past 18 months. We also worked very hard to get a branch campus of the University of Washington placed right here in downtown Tacoma. By the end of this decade, we will have a campus of 11,000 students here. And by 2003 we will have light rail, commuter rail and a new convention center, with all of these facilities offering connections to the Tacoma Dome." Like the Washington town 2,775 highway miles away, LaGrange, Ga., in rural Troup County about 60 miles southwest of Atlanta is building an infrastructure of connectivity that most large metro markets don't even have. Two networks form the backbone of LaGrange's telecommunications capability: a 57-mile-long fiber network serving more than 40 large commercial, institutional and industrial customers; and a 150-mile-long broadband hybrid fiber-coax network. The city-owned fiber network features an OC12 SONET ring with 32 nodes and is a competitive access provider (CAP) for DeltaCom, Globe and other interstate carriers. The fiber-coax network is a 750-MHz two-way system offering voice, data and video services, as well as two-way, high-speed cable modem access. LaGrange garnered international attention last year when it announced free Internet access to all 27,000 city residents through their cable TV service, but the economic impact of LaGrange's telecom networks go far beyond that. "We went to the Fortune 500 companies that are based here asked them what they need, and they told us," says Joe Maltese, the city's director of community and economic development. "They told us that the city needed to be able to provide digital switching, a point of presence (POP) as an entry ramp onto interstate carriers, and the deployment of broadband cabling. We have since implemented all of that." The result is a two-way system of communications that connects every business, resident, school, medical facility, industrial park, government office, college and public utility provider in LaGrange. Local Fortune 500 employers who benefit from this network include Duracell, Kimberly-Clark, Mobil Chemical, Dow Jones/Wall Street Journal, Caterpillar, International Paper, Georgia Pacific and a new 1.2 million-sq.-ft. (111,480-sq.-m.) Wal-Mart distribution center. For its efforts, LaGrange was awarded the "Intelligent City of the Year" honor for 2000 by the World Teleport Association of New York, beating out Chicago, New York, London and Toronto. Last year's award, which recognizes cities that are leaders in preparing their communities for the broadband age, went to Singapore. Like most rural towns its size, LaGrange faced a choice in the early 1990s: either build this network itself or get bypassed by the New Economy. "The big telecom companies in Atlanta made a business decision not to provide broadband service here," says Jeff Lukken, mayor of LaGrange and operator of the local Chevrolet dealership. "We approached BellSouth about partnering with them to build such a network, and they said no." According to Martin Gidron, managing editor of the UT Digest in Silver Spring, Md., LaGrange is far from alone. "Generally, the small towns around America tend not to be able to get the broadband networks from the big companies," he says. "But for the towns it's a matter of economic development and economic survival. The tier-one cities are already pretty well served, so the movement now is toward second- and third-tier markets." Gidron's UT Digest, published by Pike & Fischer Inc., produces a quarterly supplement detailing activities in utility communications. As of Oct. 2, 2000, Gidron had catalogued 97 publicly owned electric utilities with telecom activities in the US. Offering everything from cable TV and Internet service to high-speed voice and data communications, these entrepreneurial power companies can be found in such unlikely locations as Alta, Iowa; Benson, Ariz.; Lebanon, Ohio; and Glasgow, Ky. So far, only three states have banned municipally owned utilities from providing telecom services, but Gidron says that number could grow as the giant telecom providers get more active in lobbying their state lawmakers to stop government entities from competing against them. In Blacksburg, Va., a unique partnership between Virginia Tech and the town government has produced a virtual community based entirely on the Internet. Called the Blacksburg Electronic Village, the network officially opened its doors for business in October 1993. Today, the BEV reaches more than 87 percent of Blacksburg's 38,000 citizens and more than 75 percent of the community's businesses. ISDN and Ethernet were made available in 1994. By late 1997, there were at least 24 new high-tech businesses in the Blacksburg area. As a result, Blacksburg has the highest per capita availability of ISPs in the world, with more than a dozen local and national providers offering modem and dedicated access, including cable modem, ISDN and DSL services. Current projects include the design and development of a town-wide all-fiber network and the integration of wireless technologies into the wired network. Community projects like the BEV are the wave of the future, says Virginia Secretary of Technology Don Upson. "Our goal in Virginia is to build a high-speed broadband network throughout the state," says Upson, who before accepting the Cabinet-level position was vice president of business development at Litton PRC. "This is stakeholder-driven government." Upson says the completion of high-speed networks throughout the state is one of his government's highest priorities. "Virginia has one of the most competitive environments. The buildout of DSL is occurring faster in Virginia than any other state," he says. "What the individual user needs is free and unlimited access at increasing speeds." Virginia also deregulated its power industry last year -- a move Upson says will encourage companies like Virginia Power to accelerate the growth of broadband services throughout the state. "Unlike some other states, we rely completely on private networks and encourage the building of those," he adds. "Virginia Link is the answer for businesses. There has to be that private-sector initiative." Virginia has this in common with places like Tacoma and LaGrange, however: "We are using government to bring businesses together," Upson says. "The reason that companies are looking at Virginia is because everything here communicates the message that we are open for business. When a company can be anywhere, they want to be where the taxes are low and regulatory environment is friendly." Like Blacksburg, Tacoma and LaGrange offer some significant cost savings for high-tech industries looking to expand or relocate. In Tacoma, a new high-tech company will face no property taxes for the next 10 years. In LaGrange, newcomers face no property taxes at all. That is true because LaGrange is one of only a handful of cities in the nation that levy no municipal ad valorem taxes. Instead, the city balances its entire $70 million budget on revenues gleaned from the wholesale and retail trade of public utilities. In Tacoma, the city government was able to finance the entire construction of the $100 million Click! Network through proceeds of the sale of electricity generated by the city-owned Tacoma Power Company. Plus, office and industrial space users in Tacoma find rental rates of about half those charged in Seattle. Prime class A office space in downtown Tacoma can by leased for as low as $20 per sq. ft. That same space in Seattle would cost anywhere from $38 to $50 per sq. ft.
Cederstrand of Colliers in Tacoma says the combination of low costs and high connectivity makes Pierce County a natural location for doing business. "Right now there are $620 million in public and private development projects taking place in the city of Tacoma," he says. "More than $320 million of that total is coming from private investment. Our phones are ringing off the hook, and we are filling these buildings as fast as we can build them." In LaGrange, local business leaders say they also detect a new entrepreneurial spirit and energy spreading throughout their community. "High-speed access to the Internet has given my business a competitive edge," says Edward Smith, who runs the Hutchinson-Traylor insurance company in LaGrange. "I can now transact more business in less time without having to add to my staff. We do around $20 million a year in written premiums, with about 60 percent of that business being commercial. From an economic development standpoint, I think that our base of potential high-tech clients will grow because of this new network in LaGrange. In fact, we've moved to try to make insuring high-tech businesses one of our niches." It's all about connectivity, says David McCall, senior vice president of Charter Communications, which provides the cable TV service for LaGrange. "LaGrange is a great example of all that is exciting about the broadband revolution," he says. "Charter and LaGrange recognized that the powerful technology of cable could offer this community a host of communications opportunities when we became partners. Now, that power will connect them to the world." ©2001 Conway Data, Inc. All rights reserved. SiteNet data is from many sources and is not warranted to be accurate or current.